Carrie (Bartels) Kramer is a mystery. I found her name listed with her family in the 1900 census. This was the first time I'd ever heard of her. She was not enumerated in any other census records with her Bartels family. Later, when I was doing "cemetery hopping" with my Grandpa, I stumbled--almost literally so!--upon her gravestone in the Ferdinand Bartels family plot at the Calvary Cemetery in Milwaukee. KRAMER--On Thursday, Jan. 2. at 2:15 p.m. Carrie Kramer, daughter of Mr. and Mrs. Ferd. Bartels, at Jersey City, Heights, N. J. at the age of 32 years. Funeral home of her parents, 535 National Ave. Services at Holy Trinity church on Greenbush, corner Park. Internment at Calvary cemetery. 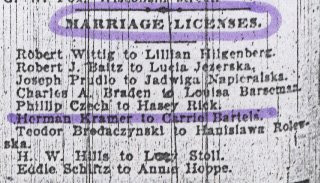 I know she married Herman Kramer, per the marriage license I found in another Milwaukee Journal newspaper. They applied for a license and, I assume, got married... but, then what happened? She ended up in New Jersey at some point (she died there). Why did she go there? What caused her death? What happened to Herman Kramer after that? Does anyone have additional information about her?